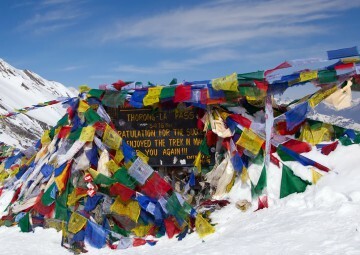 The Amphu Lapcha Pass is regarded as one of the most challenging and technical high passes in Nepal. This trek starts at Lukla and passes through the remote and wilderness trail, dramatic Amphu Lapcha Pass (5,800m/19,029ft) and ends back in Lukla. We have added an expedition to Mera Peak en-route reached after crossing the Mera La pass (5,415m/17,766ft) to supply the demand of adventure trekkers who are looking for more challenging treks and climb small peaks. Mera Peak (6,654m/21,831ft) is the highest NMA listed trekking peak in Nepal, situated on the edge of famous Khumbu region and boasts an absolutely stunning summit panorama that includes five of the world’s 8000m peaks – Mt. Kanchenjunga, Mt. Makalu, Mt. Lhotse, Mt. Cho Oyu and Mt. Everest. Mera Peak is becoming more popular among trekkers as it is ideally a suitable mountain for beginners. Although Mera Peak is physically very demanding, the climbing itself is quite technically straightforward not exceeding 30° on the snow slopes. The only qualification required to climb Mera Peak is excellent physical fitness and passion to adventure sports. Our Mera Peak itinerary allows a gradual acclimatization for the trekkers and climbers. After the summit of Mera Peak, we proceed towards Amphu Lapcha (Amphu Labtsa) pass dropping down into the uninhabited Hinku (Honku) valley situated to the east. The upper Hinku section is truly a wild valley where it is very unlikely to meet other trekkers. The valley is high and open, fringed with broad moraines and sharp white peaks and a wonderful place to camp. The glacial lakes and views of Chamlang (7,319m/24,013ft) and Baruntse (7,129m/23,390ft) are significantly attractive here. 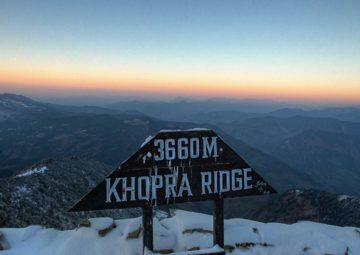 The crossing of the Amphu Lapcha pass is technically more demanding and adds an excitement of breathtaking views to the adventurous trekkers and climbers. The Amphu Lapcha pass is ascended with the protection of fixed ropes over straightforward icefall and the descent requires a short abseil to a broad snow terrace. The pass is tricky owing to steepness although it is at a lower altitude than Mera (6,654m/21,831ft) and Island Peak (6,160m/20,211ft). The trek connects with the Khumbu region at Chhukung. The trek to the Everest Base Camp and Kalapatthar is tremendous and visit of the pristine Sherpa villages and monasteries makes the trip memorable over a lifetime. Day 1 Day 01 :Arrival in Kathmandu. Reception by the Office Representative at the airport and we shall transfer you by our comfortable vehicle to a hotel located in the downtown. Day 2 Day 02 :Kathmandu City Tour. Sightseeing by an experienced City Tour Guide. There are a total of 7 World Heritage Sites in the city, including at least fifty important shrines and temples in the Durbar Square alone. They are Swoyambhunath, Boudhanath, Pashupatinath, Kathmandu, Patan and Bhaktapur Durbar Squares and Changunarayan Temple. Tour includes 4 to 5 sites in one day. Day 3 Day 03 :Fly Kathmandu to Lukla (2,840m/9,318ft), preparation for the trek. We set off early morning from our hotel to domestic airport for Lukla flights. After a 35 minute scenic mountain flight by a small aircraft, we land in Lukla airport (Tenzing-Hillary airport). Today we stay in Lukla and prepare for Mera Peak expedition. Day 4 Day 04 :Trek Lukla to Chutanga (3,050m/10,007ft). From Lukla we will then commence the first part of our trek to Chutanga. This trek takes us through pine and rhododendron forests. Trekking time 5-6 hours. Day 5 Day 05 :Trek Chutanga to Tuli Kharka (4,320m/14,173ft) crossing over Zatrwa la pass (4,855m/15,929ft). Today we trek through a landscape which is wild, rocky and impressive passing through the Zatrwa la pass with its cairns and prayer flags on top. Trekking time 6-7 hours. Day 6 Day 06 :Trek Tuli Kharka to Tashing Dingma (3,650m/11,975ft). From Tuli Kharka the path traverses the hillside first south eastwards crossing several spurs. Our trek will take us through blue Himalayan pine, rhododendron, hemlock and birch there is also a variety of alpine scrub plants which decorate the hillside and include the unusual “Snowball flower” (Saussurea Gossypiphora). Trekking time 4-5 hours. Day 7 Day 07 :Trek Tashing Dingma to Kothe (4,095m/13,435ft). We trek the path which follows the west bank of the Hinku Drangka northwards, gradually climb and reach Kothe. Trekking time 4-5 hours. Day 8 Day 08 :Trek Kothe to Thangnak/Tangnag (4,350m/14,272ft). Today we trek via the Kharkas of Gondishung. Not far from Gondishung beneath a great rock overhang is a small gompa and prayer flags. The Buddha statue is especially impressive in such a remote setting. Beyond Gondishung the valley narrows between the flanks of the Kusum Kangaru (6,367m/20,889ft) to the west and the truncated far western peak of Mera (6,225m/20,424ft) to the east. This peak has a magnificent 1800 meters (5,905ft) rock face first climbed by the Japanese in 1985. Trekking time 4-5 hours. Day 9 Day 09 :Trek Tangnag to Khare (5,100m/16,733ft). Day 10 Day 10 :Rest day at Khare for acclimatization. Basic training for climbing. Today we will aid acclimatisation by ascending the moraine above Khare to the start of the Mera Glacier (5,300m/17,389ft). It is demanding climb as it is quite steep apart from a short flat section approximately halfway to the glacier. Once we have reached the first ridge we will have first-rate views of our route via the Mera la (5,415m/17,766ft) to high camp and the summit. We will also take the opportunity to get familiar with our equipment; using crampons and ice axe, walking in plastic boots, fixed ropes will be set by our guide so that we can put into practice ascending using a “jumar” and descending using a “figure-of-8” or belay device. We will then descend for a late lunch. Day 11 Day 11 :Trek through Mera la Pass (5,415m/17,766ft) to Mera Peak High Camp (5,800m/19,029ft). Climbing day: This morning we will leave Khare and follow the trail for 1-2 hours to the top of the moraine above Khare, before continuing the climb up a rough scree slope to the area just below the lower region of the Mera Glacier. We will then crossover and climb to the right of the glacier. Crampons will be required for the short climb to reach the plateau of Mera la where we will see the route to High Camp and the summit of Mt. Mera. We climb further for the High Camp where we will rest for the night. It is a steep ascent for around 5-7 hours with wonderful views of five of the world’s highest peaks, Everest, Lhotse, Makalu, Cho Oyu and Kanchenjunga. We will camp overnight in this spectacular Himalayan location. Day 12 Day 12 :Climb Mera Peak High Camp to Summit (6,654m/21,831ft), trek back to Base Camp. Summit day: The climb begins at around 2am so that we can make it during the best part of the day. Crampons, ice axe and ropes are required for the summit approach. We will climb a number of easy slopes before reaching the central summit (6,461m/21,198ft) and from here we will use a fixed rope for the last steep part of the climb. Whilst ascending we will have the breathtaking sun rise view of Kanchenjunga to the east and the peaks of Makalu and Everest as we climb. At the summit there are fantastic views across the Himalaya; Kanchenjunga, Makalu, Lhotse, Cho Oyo and of course Everest an opportunity for a great photo shoot. We then make a careful descent back to the Base Camp for overnight halt. Total climbing/trekking time 8-10 hours. Day 13 Day 13 :Spare day for weather. The spare day is for smooth journey. We can use this day if the weather gets worse and we are unable to complete the summit on the planned day. This day can be useful if someone gets problems in acclimatising well enough to make the ascent. Day 14 Day 14 : Trek Base Camp to Hinku/Honku Valley (5,220m/17,126ft). Today we continue into the upper yak pastures of this incredible remote valley. We have a great view of Chamlang (7,319m/24,013ft) on our left while the Baruntse (7,129m/23,390ft) comes beyond. Overnight in camp. Trekking time 5-6 hours. Day 15 Day 15 :Trek Honku Valley to Panch Pokhari (4,500m/14,764ft). We continue along this lonely trail with the great views of the majestic mountains. We camp overnight in Panch Pokhari (Five Lakes). Trekking time 5-6 hours. Day 16 Day 16 :Trek Panch Pokhari to Amphu Lapcha (South) Base Camp (5,200m/17,061ft). Today we trek to Amphu Lapcha Base Camp. Amphu Lapcha is one of the challenging high passes in the Khumbu valley. We climb steadily experiencing the wilderness of the Honku Valley. This is one of the remotest trekking regions in Nepal. We see Chamlang (7,319m/24,013ft) with hanging glaciers on its South-West and North-West faces on the right. We camp overnight in Amphu Lapcha Base Camp. Trekking time 6-7 hours. Day 17 Day 17 :Trek through Amphu Lapcha pass (5,800m/19,029ft) to Chhukung (4,730m/15,519ft). Today we start our early climb on the steep sections of rock and ice. Rope climbing is required for today’s trek. It is better to start the climb before the snow melts. The last sections of the Amphu Lapcha pass winds up through snow shelves. We still have a steep descent to cover on ropes leading down to the moraine. We are now at the Amphu Lapcha (North) Base Camp; we camp and spend the night there. We continue our trek downhill and arrive at Chukkung. We are again back into the civilization after the wilderness of the Honku valley. We stay overnight at Chhukung. Trekking time 8-9 hours. Day 18 Day 18 :Trek Chhukung to Lobuche (4,910m/16,109ft). Chhukung is the starting point of the Island Peak. We continue our trek to Dingboche and deviate towards Lobuche. This is a busy place with trekkers camping in various spots on the far side of the stream and around the lodges. We stay overnight at Lobuche. Trekking time 4-5 hours. Day 19 Day 19 :Trek Lobuche to Everest Base Camp (5,364m/17,598ft), return trek to Gorakshep (5,140m/16,864ft). Day 20 Day 20 :Trek/Climb Gorakshep to Kalapatthar (5,545m/18,192ft) and return trek to Thokla (4,620m/15,158ft). Today’s trip is not only literally the “high point” of our entire trek but it also has the absolutely high point with unbelievable views from the summit of Kalapatthar. The long awaited trek starts around 5.00am. The climb takes about 1-2 hours (depending upon the route chosen) to reach the summit. On the arrival at the summit, one can experience the most fantastic sunrise over Mt. Everest. Kalapatthar is a spur of Pumori (7,165m/23,507ft) and in Hindi means “black rock” which is appropriate. It has two summits and two ascent routes, both paths being clearly visible from Gorakshep. The left-hand path which wriggles its way to the secondary summit (5,545m/18,192ft) takes 1-1:30 hours and the other which zig-zags up the eastern flank to the higher summit (5,623m/18,448ft) takes 1:30-2 hours. Neither route is technically difficult. Another alternative is available which takes in both summits, climb the left-hand trail to gain the lower top, marked with a number of slender cairns and then continue along the ridge scrambling over rocks and reach the higher summit with its flutter of prayer flags. From both summits, a truly incredible panorama is spread before you. Although Everest is of course the main focus of attention, the ice cone of Nuptse which from this view point appears higher than Everest, has stunning beauty. Having really soaked up these incredible views we will return downhill to Gorakshep and then continue our trek to Thokla for overnight rest. Trekking time 5-6 hours. Day 21 Day 21 :Trek Thokla to Pangboche (3,930m/12,894ft). From Thokla/Dughla, we re-cross the Khumbu Khola on the wooden bridge and and continue on to Pangboche. 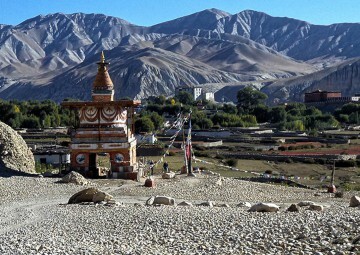 There is a famous gompa at Pangboche believed to have been the oldest in the Khumbu region. We stay overnight at Pangboche. Trekking time 4-5 hours. Day 22 Day 22 :Trek Pangboche to Namche Bazaar (3,446m/11,306ft). Day 23 :Trek Namche Bazaar to Lukla (2,840m/9,318ft). Again we proceed southward crossing and re-crossing the Dudh Koshi at intervals. We stay overnight in Lukla. Trekking time 6-7 hours. Day 23 Day 24 :Fly Lukla to Kathmandu (35 minutes), hotel. We take the 35 minute breathtaking flight from Lukla. Transfer to hotel. Day 24 Day 25 :Final departure. Transfer to airport – fly out Kathmandu. Or, extend your trip with Jungle Safari adventure, white water rafting or a trip of your choice. Necessary climbing equipment including Top quality high mountain Tents, Fixed and Main ropes, Ice-screws, Safety ropes, Jumars,Karabiners, etc.